Disclaimer: As part of the 2017 RockNBlog team, I receive a Global Tour Pass to register for their races, but all thoughts and opinions are my own. One of the best parts of being a runner is racecations. You get to enjoy a race, often in a new city, and explore all the sights of that city. Planning a racecation is not easy! The easy part is signing up for the race, but then you have to book all your travel arrangements. After that, all that’s left is packing for the race. To make this process as easy as possible, I’m sharing some tips to help you pack for your epic racecation! As runners, we accumulate a lot of clothing. We also need to pack multiple race day outfits depending on the weather. If you’re like me, you only travel with a carry on suitcase to avoid paying a checked bag fee. Making the most of the space in your suitcase is of the utmost importance! Instead of folding or throwing your clothes in the suitcase, try rolling all of your clothes. Rolling your clothes helps you avoid creases and wrinkles that can come from folding clothes. In addition, rolling your clothes makes it easier to stack them up in your suitcase, or fit them into corners of your suitcase. I can’t even begin to tell you how much clothing I am able to fit into my suitcase by using this method! After you do a few racecations, you will appreciate having a packing list! There’s nothing worse than getting to your hotel room to unpack and realizing that you forgot something at home. Sometimes you can pick last minute items at the Rock ‘n’ Roll Expo, but don’t depend on that! For example, what if the Expo doesn’t have your brand or flavor of running fuel, or socks, or in some rare cases, sneakers (yes, I know someone that actually forget their sneakers)! Save yourself time, and money, and refer to your packing list when packing your suitcase. I keep a printed copy of my list in my suitcase so that it’s always there when I need it. Eagle Creek makes fantastic products for all your packing needs, especially for racecations! Their Pack-It Sport products are perfect for all of your post-race sweaty clothes. You can put your clothes in these products so that they don’t stink up all the other items in your suitcase. Don’t know where to put your sweaty sneakers? You can zip them up in the Shoe Locker bag. Did you go swimming during your racecation? Put your bathing suit in the Wet Zip Pouch to keep everything else in your suitcase dry. The Sport Daypack would be perfect to for bag check at a race. You could pack it full of clean clothes, socks and sneakers to change into after a race. All of these products will make packing so much more organized. If you’re traveling for a racecation soon, be sure to check out their website! That’s it! I hope that these tips will help you while packing for your epic Rock ‘n’ Roll racecation. I’ll be at a few RnR races this Fall – Philly, Montreal and Brooklyn – hope to see you out on the pavement! I’m also linking up with Annmarie from The Fit Foodie Mama, Jen from Pretty Little Grub and Nicole from FitFul Focus for Wild Workout Wednesday. And finally, I’m linking up with Rachel from Running on Happy, Susie from Suzlyfe, Lora from Crazy Running Girl, and Debbie from Coach Debbie Runs for Coaches’ Corner! Great tips! I love rolling my clothes when I pack for a trip. And I am all about the lists! Especially when packing for a race, its absolutely necessary otherwise I will definitely forget something. Thanks Lisa! It’s amazing how much rolling clothes can save space in a suitcase. Nice! Just what I needed. We are going on vacation, but I just found a race I can attend while there, so I will be sure to take these tips on Board! Yay! Awesome! I hope you enjoy your upcoming vacation! That is the worse forgetting electronics or not having them charged. The rolling method for packing is the best. You really can pack in a lot more! And lists are a must for me. I have lists for everything! Definitely! I can fit all my clothing in a carry on suitcase for a week’s worth of travel! These are such great tips – I get so anxious about packing things for a race/trip/anything! Lists are so helpful. No problem! Glad you found the tips helpful! I’ve got packing for long weekends down to a science, but I have to be even better on my Vegas trip. I plan to bring back lots of chocolate boxes from their chocolate factory, and even with stores in the airport, I’m trying to figure out how many is too many. I don’t think they’re big boxes, but I still need to make sure my carry-on can pack a few. I’m sure if you leave a little room in your carry-on suitcase that you’ll be able to it the chocolates. If not, you can always put them in your purse or bookbag! My first half marathon will be the Vegas RNR! Loved the tips in here! You’ll have a great time in Vegas! I too do anything and everything I can to avoid paying checked bag fees. If I’m not traveling on Southwest with checked baggage included, I too make sure to use every nook and cranny of my suitcase. And since having a child, I’ve put together a packing list that I always pull up anytime we travel as a family. It took awhile to feel as though I had included everything on it, but its become an invaluable resource. I had a little bit of trail and error with my packing list but I finally think that I have it correct now. It really does help me pack so much faster when getting ready for a racecation! 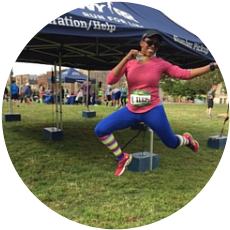 Such great tips – I LOVE my Eagle Creek Gear! Reading this makes me sad that I am not running another RnR this year but maybe next! I hope I get to see you at a RnR race next year! I love my Eagle Creek gear! I use it all the time. I don’t have any racecations planned at the moment, but I’ve had some great ones in the past, including Paris, France, and Honolulu. I really like Eagle Creek products too. You’ve had some awesome racecations in the past! Fun tips! I travel once or twice a month for my business, so have it pretty much down. At this point, I have a dresser drawer dedicated to the things I bring on every trip so I only have to think about what’s needed for that particular trip. I’ve been on a few racecations, so just a few more items and I’m on my way! that’s such a good idea to have a dresser drawer dedicated to your travel items! Thank Lora. Forgetting my gels is one of my biggest fears! I have a list of ESSENTIALS and make sure they get into my bag first. Everything else is a nice to have! That’s a good way to go about it too! I recently started rolling, and it helps so much. I’ve heard great things about Eagle Creek, too! Eagle Creek products make packing so much easier! Thanks Kim! I keep my list in the suitcase, that way I have absolutely no excuse lol. Rolling is amazing for saving space! I also roll my workout gear and shirts in my drawers at home. You’re so right that it makes its easy to pick out a color! All good ideas! Thanks for sharing. I’m all about the packing list (really a spreadsheet that evolves). I like packing cubes too. It may be time to replace them. I’ll have to check out the Eaglecreek ones. The Eaglecreek products are great and I know a lot of runners that absolutely love them! I love my Eagle Creek Gear like whoa. So convenient, easy to use, and easy to clean. It makes packing all my workout gear an absolute snap. Their products make packing things so easy! Girl, I make lists of lists of lists. And then I check each list at least five times. Packing for racecations are stressful!!! LoL, we are SO alike, it’s scary! Great tips! I did my first two destination races this year, and packing was hard! It can definitely be hard because you want to make sure that you pack everything that you need! You know I love me a racecation! I always bring a lacrosse ball with me as well to roll out kinks! That’s something I need to add to my list! Great tips! I have a few race actions coming up and packing is always an issue, I tend to take more than I need and always forget something.